Google is full of fun easter eggs hidden within search queries. Remember the barrel roll? Here’s one more that’s been discovered, just in time for the holiday season. 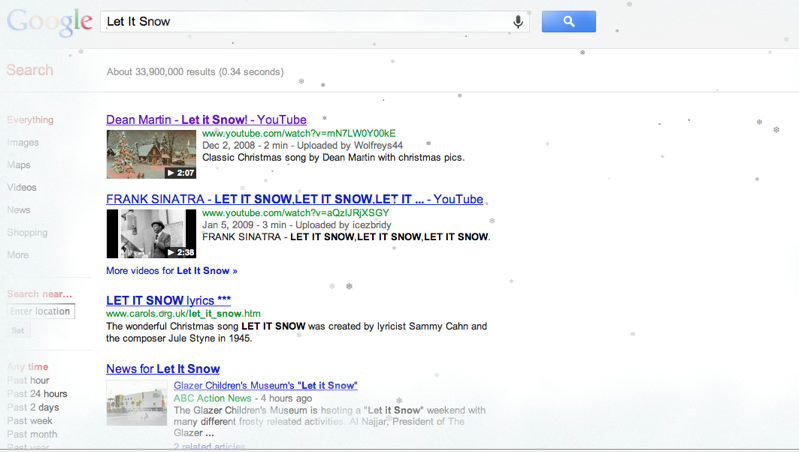 Type ‘let it snow’ in search, and you’ll see snowflakes falling down the page. The first hit is the Christmas carol ‘let it snow’ by Dean Martin (which we’ve embedded below). Eventually your search results page will cloud over and the search button turns into a defrost button to clear out the clouds. Here’s a list of some of our favorite easter eggs over the year. Enjoy!